As of xUnit 2.0 the test framework no longer captures any native outputs, this is by design. Now the question is: where do you write your test output? 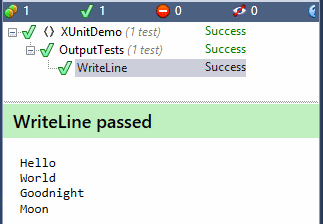 You now have to write all test output to an interface, ITestOutputHelper, that is injected into your test's constructor. This design seems to have polarized developers a bit, as not everyone enjoys being require to add a constructor to your test classes. Personally, as a huge fan of dependency injection, I really like this solution. Spoilers: My next blog post will be about how to combine this with Common.Logging and NLog.